I seem to be spending quite a bit of time these days bundled up by a fire, craving rustic country-style foods and not having much gumption to slave in the kitchen! I’m pre-occupied with remaining holiday details; shopping for last minute gifts, the wrapping ritual that has yet to commence and decking our beautiful tree which has stood proud in its stand for over a week as we chase that ever elusive ‘spare time’ to do it! Time really is at a premium at this time of year. It feels like the closer to time off one gets, the more there is to get done to actually arrive there. Do you ever notice that? 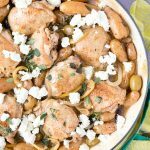 I turn to soulful meals that can go in a slow cooker, roasted chickens, short-cut Cassoulet and my favorite for winter, braised recipes. I’ve spoken about my new found passion for braising before. You may roll your eyes like kids do when their parents approach a repetitive discussion about the virtues of turning in school assignments on time, keeping their rooms clean or flossing. The thing is I believe not enough of us are braising! 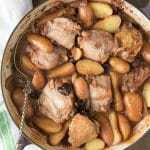 For those not yet in the know, braising is a cooking method for protein and vegetables in which the protein is seared, then combined with vegetables, spices and liquids to cook briefly covered in the oven. It produces moist, flavorful meat, well-cooked vegetables and a lovely sauce, essentially a meal in a pot. 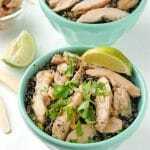 I personally love cooking chicken this way and changing up the flavors for the season. Winter is a time for bolder flavors and certainly the holidays call of easy dishes that warm the soul without gobbling up tons of time in the kitchen. 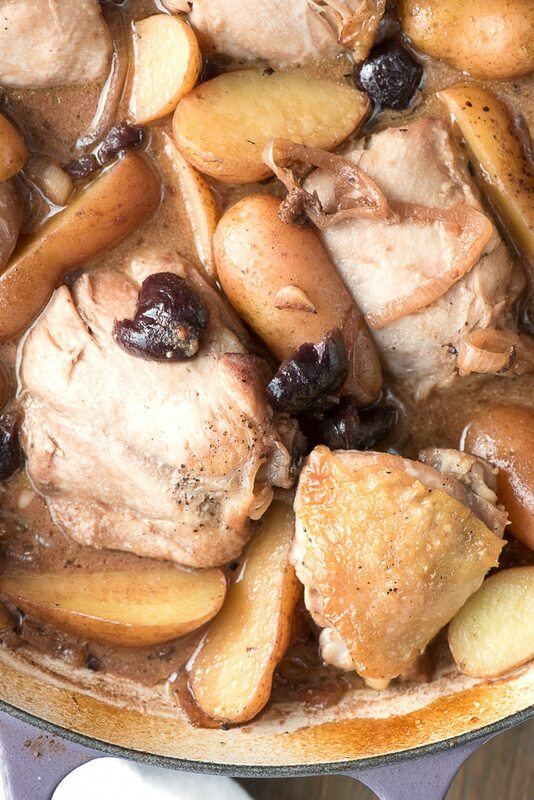 My latest favorite is Braised Cream Sherry Chicken Thighs with Cherries. Never fear the cherries are frozen and thawed since it is not the time of year for them. 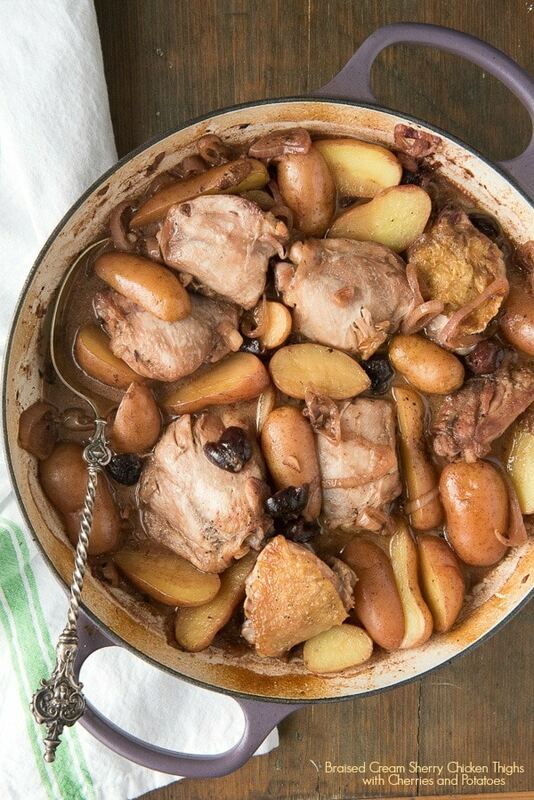 The depth of their sweetness goes beautifully with the chicken thighs and the cream sherry. Cooked with shallot rings and fingerling potatoes (which do not require peeling) make for a full meal with less than an hour from start to finish. This simple, rustic braised chicken thigh recipe is brimming with sophisticated flavor perfect for the cold weather months. The cherries used are frozen and thawed making it easy to make in any season. The shallots and potatoes make a one pot dish that can be done in less than an hour too! Drain all the fat from the pan except 1 tablespoon. Reduce the heat to medium and add the shallot slices and garlic. Sauté, separating the shallot slices into rings as they cook, until shallots are limp; approximately 4-5 minutes. Raise heat back to medium-high and add the cream sherry and chicken stock (be careful of any hot splattering of the liquid). Scrape the bottom of the pan with a heatproof spatula to release any pan drippings into the liquid. Boil for 1 minute. Remove from the heat. Add the mustard and Half and Half; stir to fully combine. Add the potatoes and cherry halves. Return the chicken thighs to the pan, cover and place into the preheated oven. 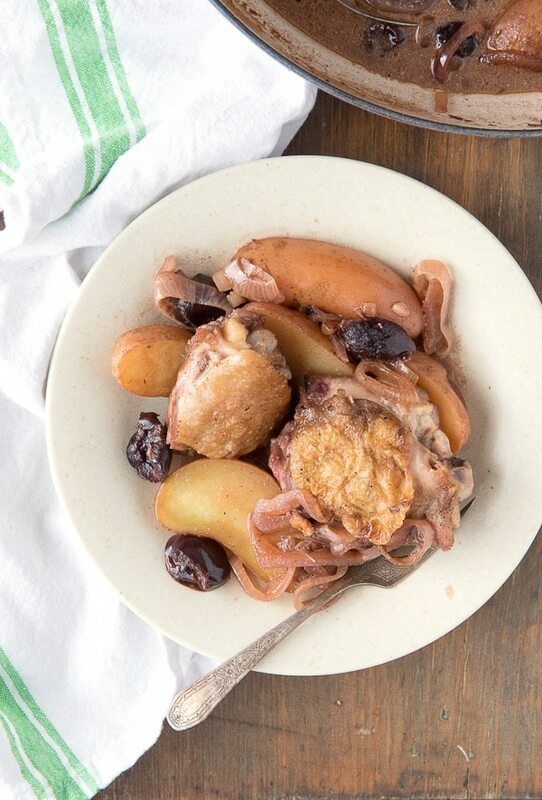 Serve the chicken thighs atop some of the shallots and cherries, with a helping of potatoes, drizzled in some of the pan sauce. Everything about this sounds fantastic. I don’t think to use cherries in anything other than dessert. Feeling inspired! What a great way to use the thighs. I’m happy to see this recipe. These look amazing! I have heard of cooking with sherry but not as much with cherries. I bet they add a nice tang! This looks like comfort food! Such a perfect meal for a cold day! This looks like a delicious recipe to try. It will be great over the holidays. I will have to get the ingredients i need to make it. 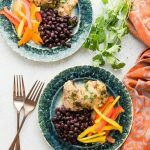 Chicken thighs go on sale often in the store, but I always have trouble on recipe ideas for them! This sounds delicious, have to try! I would have never thought about chicken and cherries. This makes me want to try to expand my palette! I love that you are bundled up by a fire place enjoying the moment instead of fussing over a Christmas tree. Now add this dish and a fire together, that’s the life! Thanks for sharing! Wow this looks amazing! I would have never thought to put cherries and chicken together! I’m adding this to my must try list! Wow I never knew chicken and cherries could go together! I love braised chicken so moist and delicious! These look absolutely delicious. I am pinning this recipe for later! 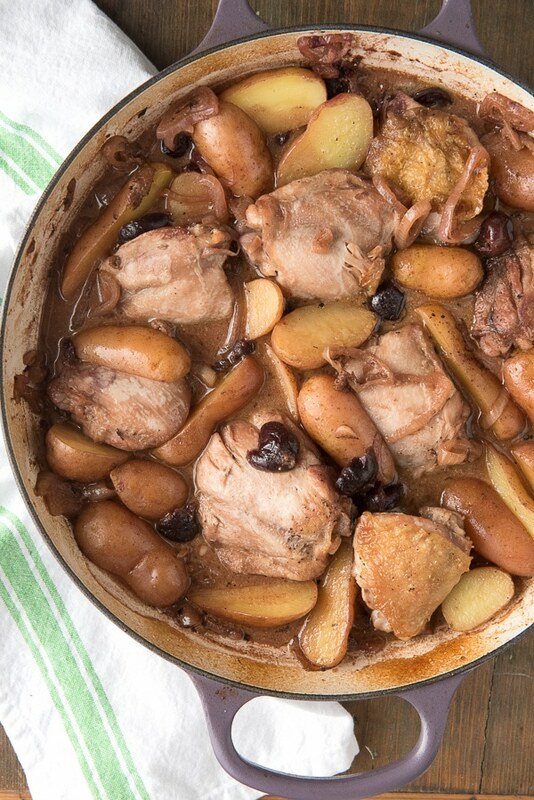 I would never have thought to include cherries in a chicken recipe. This sounds and looks so good. Oh my gosh! This looks amazing and will be on my menu soon. I just love one pot meals. Makes my life so much easier. I’d have to swap out the thighs for breasts though just because I have a weird texture issue and cant eat chicken thighs unless they are grilled or twice baked. I’m sure breasts would work too Chrystal. 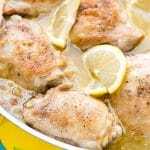 Chicken thighs, being dark meat, have more flavor naturally and stay moist. With braising being in liquid, I don’t think the chicken breasts would dry out as they can. This looks good. I love chicken and potatos together. I admit I’m a little afraid of the cherries though. I don’t usually like fruit mixed in with savory dishes. When it comes to chicken, I feel thighs are definitely the way to go. They are so much more flavorful than breasts and just as meaty. I bet they are amazing braised this way too! Wow, I’d love to give this recipe a shot this winter. I’m pretty sure my boyfriend would be excited to try this! Holy. Moly. This might be the best way I’ve ever seen to prepare chicken thighs. I can’t wait to give this a try! This looks amazing! I have never tried making chicken thighs like this before. This recipe sounds yummy and different! i think my whole family would enjoy this meal. That sounds like a nice, hearty winter meal idea. I am sure my whole family would love this.